Before the Florida elections took over the news cycle, CNN’s Jim Acosta had one final and intense exchange with the Trump White House. On Wednesday, the day after the 2018 midterms, where the Democrats retook the House, President Trump had a lengthy press conference. He gave an overview and then opened it up for questions. Of course, everyone in the room had a question. And you bet that CNN’s Acosta had one. It was a train wreck, but highly entertaining. To make a long story short, Acosta and Trump got into a tussle over the word “invasion,” which the president had used to describe the illegal alien caravan approaching our southern border. It was here that Trump unleashed, calling Acosta a rude and terrible person, and that CNN should be ashamed that they have him as an employee. Oh, it’s so…so delicious. 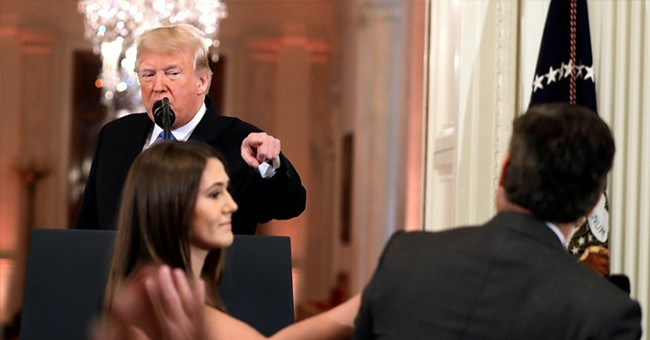 A White House aide tried to take the microphone away from Acosta, who refused to surrender it. His press credentials were revoked later that night. Cue the meltdowns and the hot takes about how this is an act that is driving us closer to the authoritarian cliff, which is just as imaginary as the evidence proving the Trump campaign colluded with the Kremlin to win the 2016 election. The Hill’s Joe Concha went on Tucker Carlson’s Show last night. Brian Kilmeade substituted in for him, which is understandable after a left wing mob swarmed his home this week. Jim Acosta, not just yesterday but for two years now, has been making it about his own narcissistic purposes. Jim Acosta is not a serious White House correspondent; he is a 40-something member of a high school debate system who goes in there, takes a policy position, usually obviously against the administration, and debates the president, or debates Sarah Huckabee Sanders, and that’s not the role of a White House correspondent. He should be either going forward, a campaign strategist, a campaign spokesperson on the Democratic side, or perhaps an opinion host in CNN prime time, or a pundit, because that is what Jim Acosta really is. Hey, those sounds like some pretty good employment suggestions for Jimmy. Nancy Pelosi might need a spokesperson or someone on her team. Acosta has been a favorite punching bag of the president, and conservative media, so it will be sad to see these popcorn moments end. Then again, there’s always Twitter to check on Acosta’s “dear diary/mirror, mirror” entries.